We’ve all heard the term fasting but the underlying reason for its health benefits are not popularly discussed in mainstream media. There’s a reason why its become so prevalent as of late – and this is mainly due to its powerful benefits it has on your body and brain. But what is intermittent fasting, anyways? 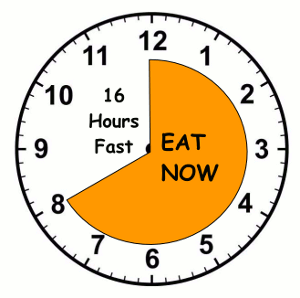 Intermittent fasting (IF) involves alternating cycles of fasting and eating. IF doesn’t tell you what to eat, but instead when to eat. The most popular IF can be seen with the 16/8 method, where individuals wait to have their first meal until 12 PM and have their last meal at 8 PM. However, there can be other variations. Feelings of hunger are usually only an issue in the beginning as your body adjusts to not eating for an extended period of time. As a fellow meathead myself, I was very excited when I saw that IF increased HGH. #Gains, bruh. When our bodies are fasting, our blood sugar and insulin is drastically reduced, along with seen increases in human growth hormone (HGH). [*] HGH is secreted by the pituitary and plays a key role in the development of children and adults. When an individual is deficient in HGH, they will likely have higher levels of body fat and lower lean body mass. HGH is typically secreted during sleep in a pulsatory manor as to not develop any resistance. What Are More Benefits of IF? When I was a lil baby giraffe in the fitness industry, I thought not eating for a long period of time was the fastest way to get rid of your gains. But hey, it seems simple enough, right? When you don’t eat, your body will begin to look for energy from other sources. That’s where the fat burning comes in. IF has been shown to be as effective if not more effective for weight loss than calorie restriction. It even shows a greater deficit in fat mass, fasting insulin and insulin resistance. [*] This leads us to believe that IF could be an amazing tool for those who are currently pre-diabetic and are at the risk of developing type 2 diabetes. Wow. #Science. The bottom line is – IF can not only severely increase your health, but it can be a much more convenient option for those of us with busy lifestyles as well. Give IF a chance and let us know how it benefits you.